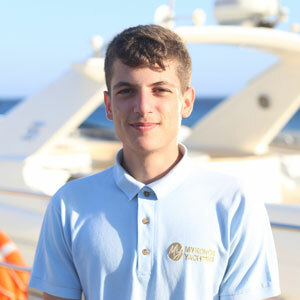 Being a graduate of the Greek Maritime Academy, he has all the qualifications and skills required to cruise you almost everywhere! When he is navigating, you are in safe hands. 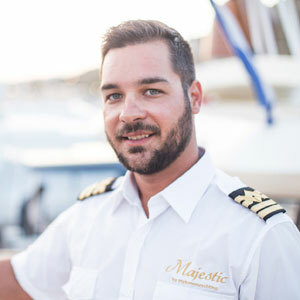 Once on board, his friendly manners and politeness will make you feel like home. 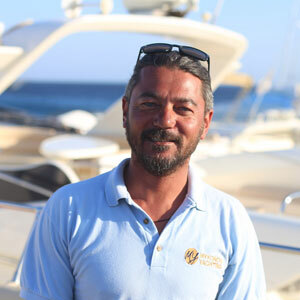 Alexandros is a sea lover, addicted to the Cyclades, with many years of experience in his Curriculum. He is sophisticated with great taste in food and exceptional knowledge in music. 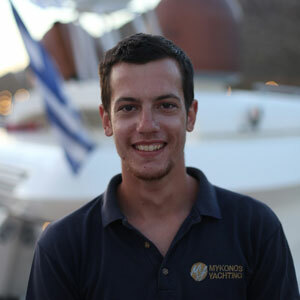 He is an authentic representative of Greek hospitality. Τhe best thing about Fratzeskos is his ability to offer something for everyone and anyone. Whenever called he is cheerful and polite, while you will be amazed by the things he knows, regardless his young age. Being at the Hospitality and Customer Service Professional for the last 4 years, she knows how to assist you. Her oxygen is the interaction with people and the constant need for learning something new. She is a calm power in disguise! What distinguishes Efrichia is her boundless energy! 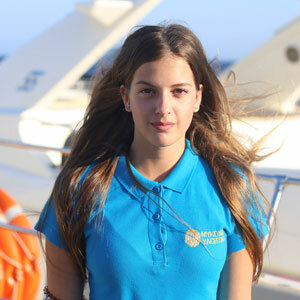 She is there to welcome you on board with a big smile and always on hand to assist you in all. It is not a matter of coincidence that her name means “Happiness” in Greek.